Who benefits from Open Path? Manage vouchers, units, program requirements, and opportunity match processes. Help clients prepare for and negotiate housing opportunities. Manage their care by being engaged in evaluating housing opportunities, care decisions, and related communications. 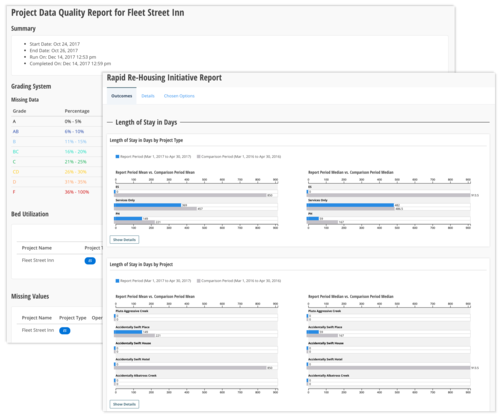 Review project performance, data quality, and generate local and Federal reports. 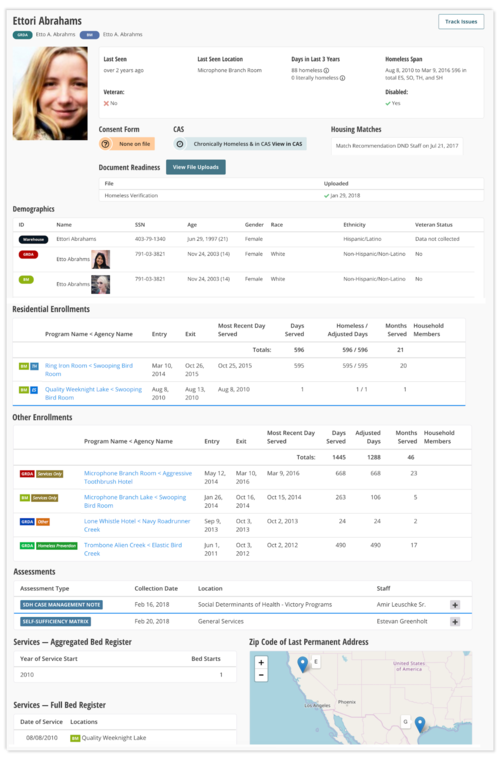 Find clients, manage documentation, participate in housing matches. Review homeless status, medical costs, social determinants of health. Coordinate care of their patients, obtain more complete social and medical history, cooperate with service agencies, generate Medicaid payment claims. Investigate recidivism, outcomes, and multi-sector interactions. tailored to the needs of a wide variety of interested people. A secure, confidential way to maintain a single set of records that aggregates health care records, case worker documentation, and governmental benefits. The Open Path Warehouse is designed to aggregate records from multiple Homeless Management Information System (HMISs). The software can assist a community that has agencies using multiple HMIS systems within a CoC, providing an up-to-date view of individual client situations. It can also be used across a large geographic region, helping to coordinate services and perform analyses. The Open Path HMIS Warehouse supports multiple ways of gathering data, frequently, with minimal labor. HMIS CSV export files are uploaded nightly, and HMIS APIs are called for additional data (including assessments, case manager information, and photos). 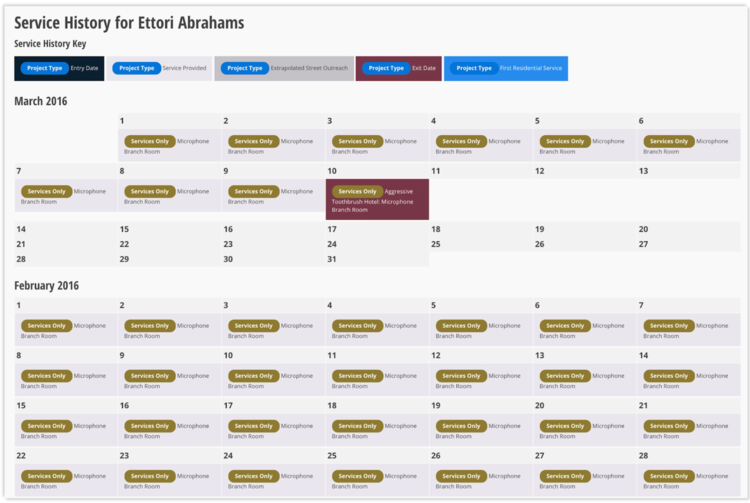 The platform can be readily customized to access third-party structured data (like calendar appointments and medication lists). 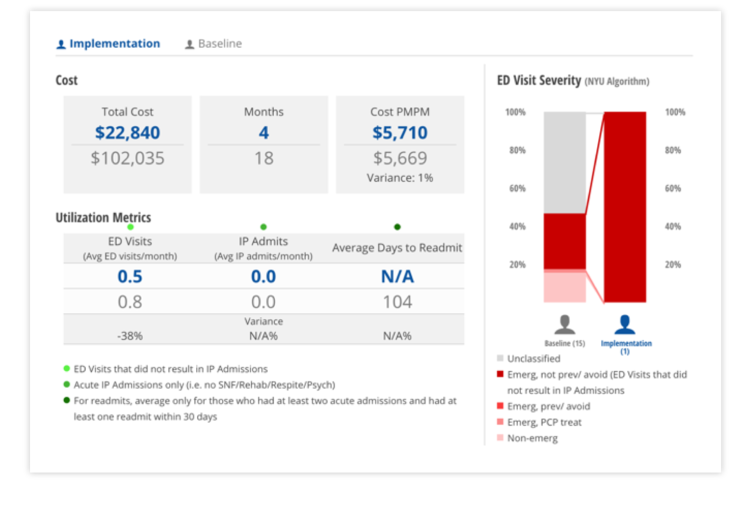 A dashboard provides administrators a clear view of the status of all import processes. Merge decisions are preserved indefinitely and are not affected by subsequent data loads. No client information is overwritten during a merge. Rather, multiple records are flagged as one for viewing and reporting. 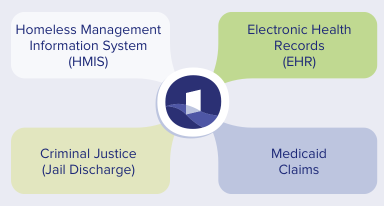 The system is designed not only to support reporting and analysis, but to provide comprehensive data on individual clients - for program administrators, case managers, working groups - to both help coordinate services, and to support fair, data-driven prioritization processes. What case managers and service providers know about a client is often limited to what their agency has collected. 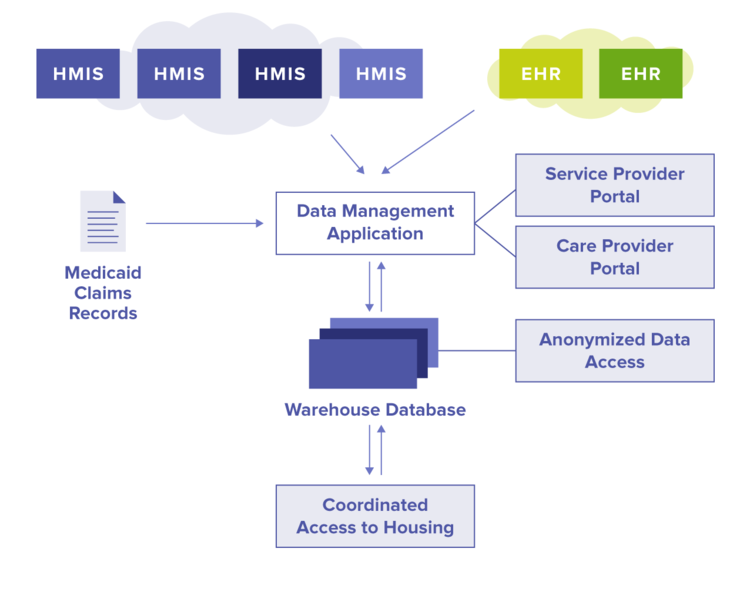 The Open Path HMIS Warehouse gives those providers a way to see a more complete, holistic client picture – a fundamental tool for managing integrated, coordinated care. The system can comply with varied data sharing agreements, limiting access by user role. With permission, a case manager might utilize a client's exhaustive housing and shelter history, program registration history, and even medical history to inform care decisions. With up-to-date records, if a client stops frequenting a shelter or program, a case manager can determine if that individual is permanently housed, is safely going elsewhere, or should be a targeted with direct street outreach activity. 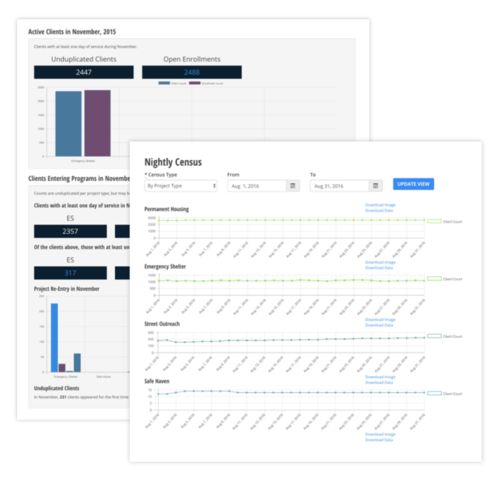 Originally conceived to support an innovative Social Determinants of Health project by Boston Health Care for the Homeless Program, the platform supports tightly integrating health data with HMIS both for analysis, and highly interactive tools for providers to coordinate care for specific people. 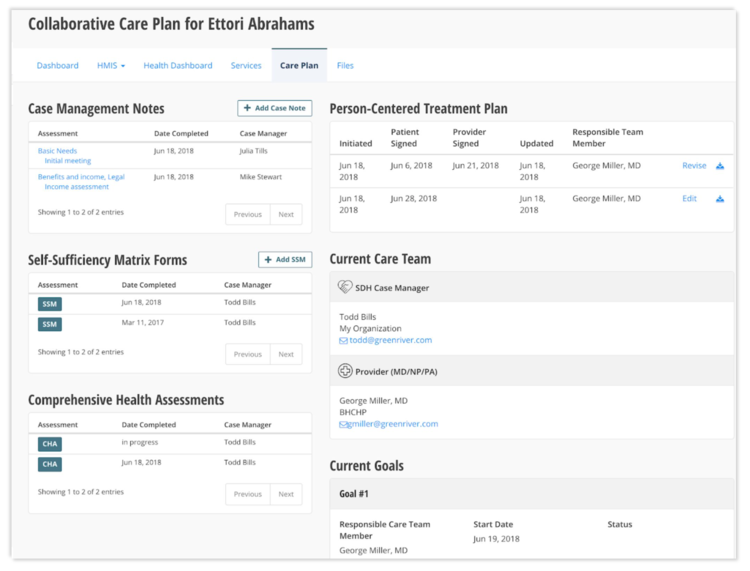 There are also features that allow the platform to be used in situations where collaborating agencies may not have access to each other's systems: things like assessments, service referrals, and care coordination notes can be entered directly into the system for sharing. The system manages and stores highly confidential personal and medical information. It also includes routines to generate and expose anonymized, aggregated data for public reporting. There are options to generate a project group report viewable (without a login) at a shareable URL. And there are ways to create anonymized export files (in Excel format) that can be used for things like ad hoc reporting and public dashboard design. Supporting Coordinated Access to housing for people who are homeless can pose procedural and logistical challenges to communities. The Open Path Coordinated Access System (CAS) is a tool that facilitates matching people with housing opportunities, and supports the intra-agency communication necessary for successful move-in. As a stand-alone system, or tightly integrated with the Open Path HMIS Warehouse, the Open Path CAS brings structure and efficiency to an often complicated process. When a housing vacancy arises (either a voucher or physical unit), Open Path CAS generates a prioritized list of eligible people. A user with permission can manage the organization of service programs, funding sources, and specific project units—each of which can have eligibility criteria. This function allows housing opportunities that come from a given funding source to be limited to veterans, for example, or women under 25 years old. 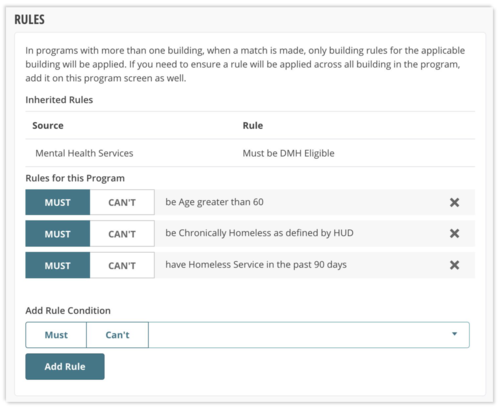 When a housing opportunity is marked available, the system identifies people who are currently homeless who meet the preset eligibility rules. It then prioritizes that list based on several factors and suggests who might best fit that particular housing chance. This prioritization logic can be customized in a variety of ways: to reflect how a community prioritizes housing; for legal restrictions; to account for the available data; to weight the length of homelessness, or degree of "chronicity" or vulnerability; the size of the eligible population; and even the predicted chance of long-term success. 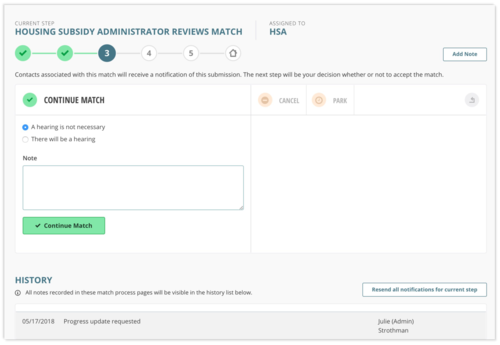 In an ideal world, a CAS can be used to identify the best match by incorporating readily available data. The complex reality is that the full context of someone's circumstances often is not documented rigorously within a database system. In these cases, the Open Path CAS streamlines the process by providing a list of potential matches, based on the available data to develop a prioritized list, from which someone—a housing navigator, say—can select. Much of the coordination of Coordinated Entry housing services is communication between people. 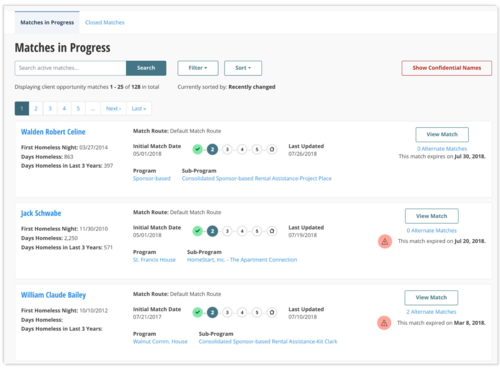 Once a housing match is selected, Open Path CAS provides a (customizable) email-based workflow to bring everyone—the homeless person, municipal staff, service provider administrators, caseworkers—into the process. Notifications containing time-expiring links provide status information and decision making capability without exposing personal identifiable information. The system also has overrides to prevent a non-responding party from delaying a housing process.